Mingle with athletic types who brave the cold Paris winter temperatures. 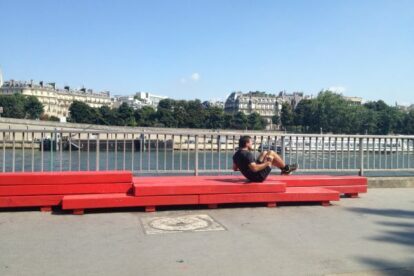 Along Paris’ Left Bank is where at one time the sounds of car horns were common, but since Summer 2013 the soundscape has changed. Today this 2.3km stretch is where you can hear a harmony of the ding-a-ling-ling of a bicycle bell alongside the din of conversations from a mix of tourists and locals who harmoniously glide through this urbanised, yet wild space. Whichever the season, and it’s great for a bracing autumn walk, it’s a space that has been reconquered from the swell of car traffic, allowing people to get together smack in the centre of Paris and chill out, longboard, stroll, keep fit, picnic. Historically, Paris is famous for having 37 bridges along its river Seine. And this new artisanal urban project gives us the chance to appreciate five of them from their bellies. The bridges are also a series of access points to get down along the 2.3km pathway of Voies sur Berges. Featuring Pont Alma, which although isn’t pretty is really solid looking. Pont Invalides has decorative stone features. Pont Alexandre III is adorned with a two-tone scheme of pure-white against a shocking-jade. My favourite is Pont Concorde which on a really sunny afternoon comes to life with reflections of the Seine dancing on its belly. Wind-up at Pont Royale and you’re in good proximity to pay a visit to Musee de Louvre.